There is apparently no end to the e-reader price war, and now you have to wonder how far away we are from the devices being given away with a two year contract ala subsidized cell phones. In the wake of the Kindle 3 being announced this week with a new lower price of $139, a totally new e-reader platform has been announced that will be making its way to multiple operating systems as well as releasing multiple models of its own hardware, including one at a new low price of $99. The Copia platform is a new e-reader system that will be running with the ePub format, and its own bookstore that will have over 400,000 books to purchase at launch, not counting public domain titles. Besides launching applications for iOS devices, the company will also be preparing one for Windows 7 slate devices. Beyond the ability to read books, the platform will feature social integration with the ability to pull in feeds from Facebook and Twitter, and share discussions on books that are being read. James McQuivey, a vice president at Forrester Research, told The Wall Street Journal, “I’m a big believer that social reading will be a large aspect of these devices in the future, though consumers haven’t been taught to expect that yet,” said Mr. McQuivey. He went on to add, “But even if that experience is intriguing, and you offer the hardware for very cheap, you’re still touting something – a social network – that people know they can access right now for free.” While he is partially right, but when you look at what you are getting for the price, it’s going to help. Thus far Copia has announced five models of e-readers that it plans to release itself, and the cheapest model is going to be $99. So, yes, you can do social networking for free, but being able to do it in a semi-mobile fashion for such a low price in conjunction with it being a reader, it may lure a lot of people to purchase it. The Wave 5 will have a five inch TFT color display, 64 MB of RAM, 2 GBs of internal Flash memory, an SD card slot expandable up to 32 GB, a built-in mono speaker, an earphone jack and support for multiple audio and image formats. For the price, it’s a pretty good bargain. Unfortunately at this time Copia is not announcing where the device will be for sale, but they assure us that they are working with major names to carry it. Beyond the low-priced model, there will be four additional models ranging in suggested prices from $129 to $299 and will be a mixture of color and e-ink displays, and Wi-Fi and 3G connectivity. Even the top of the line, the Copia Ocean Color, looks like a pretty decent deal at $299 (specs shown below). Since the brand is such an unknown factor at this point, I think it is highly unlikely at this time that we’ll see any more price moves. Sony even went so far to already state that it won’t lower its prices any further at this time, but heading into the all important holiday shopping season, who knows what might be next. What say you? 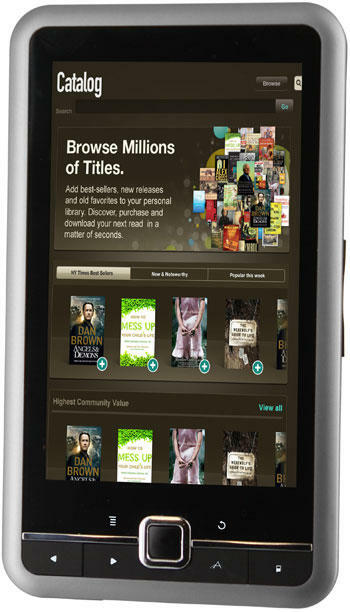 Are you ready for a $99 e-reader?